Until Jul 28 you can shop the products of Kroger with the digital coupons available on pg 3. Household items like chemical cleaning supplies are the majority of the product range of the Kroger Ad coupons. See more products on the preview of the weekly ad. On the last page see new school supplies and essential items to study any kind school lesson. School supplies to start a new semestre with a high quality materials are on sale viewable on the last page. Today you can shop these products of Kroger Ad to save more. BOGO deals are good advantage while shopping weekly products. 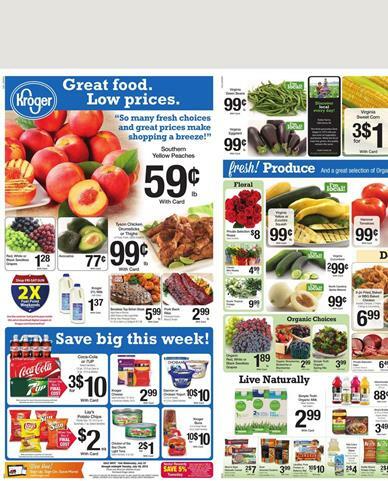 See the latest Kroger ads to catch a good deal from the Weekly ads. To see all of them you can use the preview of the latest Kroger Weekly Ad. SHRIMP Extra Large $9.99 lb. These are the most popular products of the latest Publix Ad. To view all of them you can use this category. 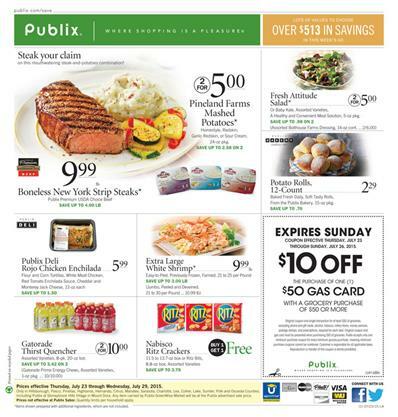 Don't miss out anything from the range of Publix Weekly Ad Jul 22 - Jul 28 2015. Campbell's skillet, slow cooker, oven sauces. PUBLIX AD BOGO free deals can be viewed on the official page and on the weekly ad browser. You can view latest products of the retailer for the best price range of the whole range. 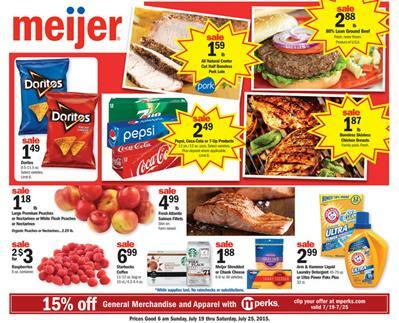 Meijer Ad Sale Range through Jul 25 prices for meat, meals and BUY 5 AND SAVE deals for the $5 off instantly. Seafood, local fresh grocery products, bakery items, breakfast deli products, packaged food, household items are all featured on this weekly ad with the prices valid through Jul 25. Last three days to go with these products. Prices good for the meat products are featured on pg 2. See new deals for the best beef products and even packaged products to cook a better lunch. Get an excellent deal by Meijer Ad to save more. Check out the products of packaged meals on pg 3 and BUY 5 GET $5 OFF deal is available there. 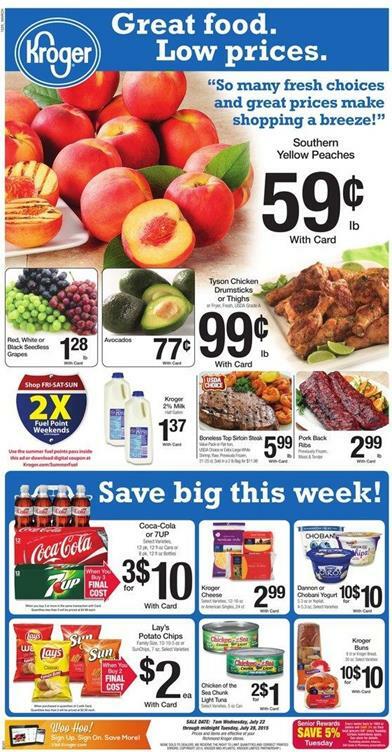 View Kroger Weekly Ad Jul 22 - Jul 28 products 2015 with the best offers of fresh grocery products and organic food items. Plus special sale like back to school products, natural beverage and soft drink variety are featured. It is easy to find seasonal products for summer. Gatorade 8 pk varieties are also featured on the summer seasonal products. Check out meals like chicken drumsticks or thighs on the pg 1. Fresh products are also featured on the first page of Kroger Ad. Big savings of the top quality products like Dannon, cheese, Lay's potato chips, chicken of the sea chunk, buns are available. Remember Fri-Sat-Sun you will get 2x fuel point weekends. While shopping for the weekly essential food products you also save a big amount of your budget with Kroger. Red, White or black seedless grapes $1.28 lb. Boneless top sirloin steak $5.99 lb. Don't forget to view healthy approved meat and fresh grocery products of this weekly ad. Kroger Ad is the best when you intend to shop meat products and simple meals. Jul 22 prices for the stationery items can be seen on the latest page. Kroger Ad is viewable on the preview page. 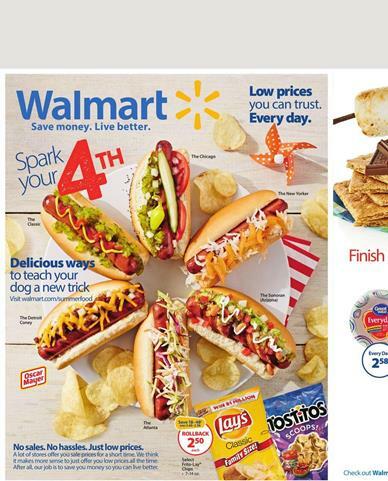 Walmart Weekly Ad Jul 12 - Jul 30 summer products 2015 prices are viewable on the preview page. To see this powerful exhibition of the latest high quality summer products featuring fishing supplies and entertainment products you can check out the link I attached to the image of the first page of the weekly ad or use the links clicking on the names of offers. Categories are listed below and they are the categories of products available in this Walmart Ad. This Walmart Ad is focused on the joyful summer days and evenings. It is not a dream to install a good set in your camping to have fun with your whole family. Area of your camping side of wheverever you desire to have fun with your family will be surrounded with the top quality products. Fishing supplies are available ON PG 4.